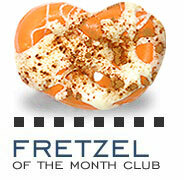 Celebrate with Fretzels custom party favors! No matter what type of party you're hosting: wedding, birthday, baby shower, christening, bar/bat mitzvah, communion, sweet 16, engagement, bridal shower, anniversary, holiday or any other festive gathering, Fretzels chocolate covered pretzels make fabulously fun and elegant party favors, sure to be memorably delicious and guaranteed to be a hit. 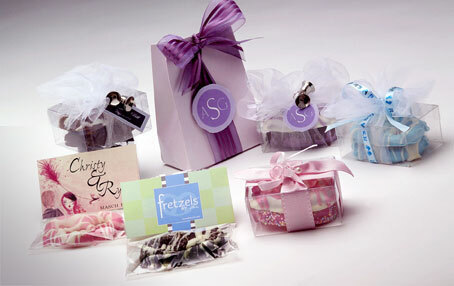 Personalized packaging (including ribbon colors and tags) and custom-colored chocolate available. Please contact us for more info. * Personalized tags available for an additional charge. We normally like to request a 4-6 week lead time on all custom orders. A $50 Rush fee may apply to orders with less than 2 weeks lead time.